The wide variety and quality of the crafts make this product one of the things par excellence to buy in Mexico. In this Caribbean country, you will find textiles, ceramics, wooden objects, precious stones, and silver jewelry, among many others. 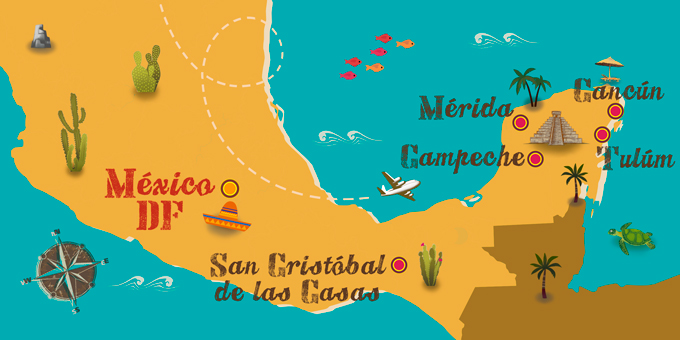 Both to give as a gift and to take back to remember your journey, Mexico offers you endless souvenirs. There are many typical Mexican products which you will want to fill your suitcase with, so make room and pay attention to the ones we recommend below. Surely you already know the famous Mexican hammocks, but what you did not know is that the city of Merida is the ideal place to buy them. Its bright colors and the quality of the fabrics make this product the star souvenir of the country. The craftsmanship of the Wixárica community of central Mexico will impress you. Tapestries, clothing, shoes, jewelry and all kinds of accessories with intricate designs and bright colors are the perfect gifts to buy in Mexico. Oaxacan artisans make typical handmade jewelry which you will see women wearing. Necklaces, bracelets, earrings and all kinds of excellent-quality jewelry are waiting for you. But if you want to take home the best silverware crafts, Taxco is the town where you have to go. Of all the jewelry that you can buy in Mexico, in this magical town, artisans work silver in an incomparable way. One of the typical products of Mexico which every traveler takes back with them is this colorful figure carved in wood. 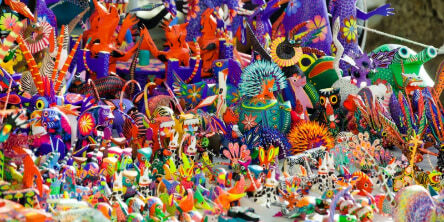 The alebrijes are figures of animals, made by hand and painted in bright colors. The figures are carved with the branches of the copal, and they carry with them many hours of meticulous work which result in a spectacular finish. Of all the souvenirs of Mexico, sombreros are the most typical and best-known around the world. So much so, that this type of hat has been declared an Intangible Heritage of Humanity by UNESCO. In San Bartolomé de Coyotepec this craft is made in a completely handmade way. For this, they use traditional techniques, such as drying in the sun and underground ovens. Undoubtedly, one of the most authentic products of Mexico which you take back as a souvenir. In this case, we go to Amatenango del Valle to see how the potters mold their bowls and pots with delicate precision. In addition to kitchen utensils, you can also take as souvenirs of Mexico mud animals, or various ornaments. In Santa María de Atzompa, this technique is used to shape pots, vases, pitchers, vases, crockery, and even toys. The clay is cooked in a traditional way and to give it its distinctive green color, a material called green greta is added. Within all the variety of objects to buy in Mexico, the embroidery of Yucatan is essential. The traditional techniques of spinning result in blankets, toques, rugs, and huipiles of great aesthetic value. Wood is another of the products used by Mexican artisans to create sculptures and figures. In San Juan de Chamula and Chiapa de Corzo, there are the best craftsmen of wood. You can take beautiful figurines of animals or religious figures beautifully carved and painted as a Mexican souvenir. Palm is an element which is used mostly in the Mixteca region to manufacture hats, mats, purses and a host of items. As a gift for your family or as a souvenir of travel, these crafts are one of the things to buy in Mexico. One of the typical products of Mexico which you can take home is the huipiles, the traditional dresses of the women of the Yucatan. They are long and very comfortable dresses, which can be white with embroidery, or with more modern designs in bright colors. Talaveras are pieces of clay with a vitreous finish of varied colors. If you want to find variety and quality, visit the city of Puebla, where you can buy cups, vases, dishes, and all kinds of ideal pieces as souvenirs of Mexico. In addition to crafts, there are even more things to buy in Mexico, such as tequila and mezcal, vanilla pods of supreme quality, hot sauce, traditional coconut, and walnut sweets, or coffee. In case you didn't know, Mexico has become a world power in the production and export of organic coffee. You can buy all this and more in Mexico, a country which offers you not only the best beaches in the world but a rich and ancestral culture which is felt through its crafts and typical products.